Oil on panel. Signed, upper right: Boldini. PROVENANCE: Sale, Paris, Hotel Jean Charpentier, curated by J.L. Vaudoyer, 7-13 May 1931, no.91. Sale, Milan, 7 November 1985, lot 95. LITERATURE: Ottocento, Catalogo dell’arte italiana dell’Ottocento, Milan 1986, p.166, no.15. Tiziano Panconi, Giovanni Boldini l’opera completa, Florence 2002, p.219. P. Dini, F. Dini, Giovanni Boldini Catalogo Ragionato della pittura a olio con un’ampia selezione di pastelli, acquarelli e disegni, Turin 2002, vol.IV, p.515, cat.992. EXHIBITED: Milan, Galleria d’arte internazionale di Milano, 1952, no.6. Born in Ferrara, Giovanni Boldini received his training from his father Antonio, a painter of religious subjects. His talent was soon recognised and, at the age of eighteen, he was already known in his native town as an accomplished portraitist. Boldini travelled to Florence in 1862, where he formed close friendships with artists of the revolutionary movement of the Macchiaioli, such as Giovanni Fattori, Telemaco Signorini and Silvestro Lega. An astute businessman and unabashed self-promoter, Boldini soon realized that, to reach a truly international audience he would have to relocate to Paris. After a trip to London in 1869, where he adored and assimilated the work of Gainsborough and Reynolds, in 1871, Boldini settled in the French capital, primarily working exclusively for the dealer, Goupil, for whom he painted landscapes and minute, essentially fanciful genre scenes in the manner of Meissonier. 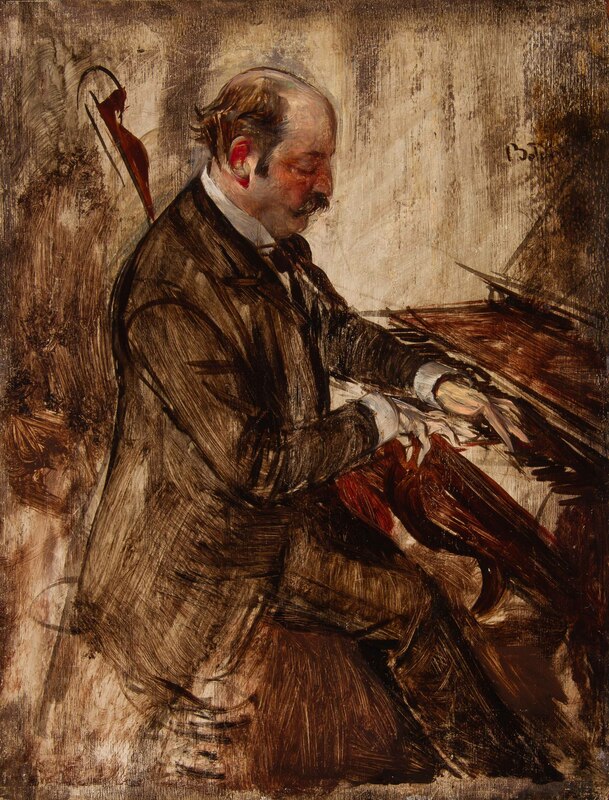 In 1874, Boldini exhibited for the first time to great public acclaim at the Salon du Champs-de-Mars, and in the following years he travelled to Germany, where he met Adolphe von Menzel and to Holland, further refining his style by studying the portraiture of Frans Hals. The artist befriended other society portrait painters such as Paul-César Helleu and James A. McNeill Whistler, and became a close friend of Degas who truly admired his work and once said of his friend: ‘Ce diable d’italien est un monstre de talent’. By the 1880s, Boldini had begun to paint his celebrated portraits of society beauties. With a sharp eye, bold, virtuoso brushstrokes and typically flamboyant style, Boldini captured not only the character and vitality of the sitter, but also the spontaneity and evanescent spirit of a magnificently decadent and sophisticated society that had gravitated towards Paris in the last decade of the nineteenth century. Among his numerous portraits, those of Giuseppe Verdi, Whistler, Consuelo Vanderbilt, the Duchess of Marlborough, Count Robert de Montesquiou, Princess Bibesco and the Marchesa Casati, are but a few of the artist’s most famous sitters. Indeed, by the early years of the twentieth century, Boldini achieved the kind of success enjoyed by his friend, John Singer Sargent in London. He was a prolific and tireless painter who remained active to the end of his long life. 1. See Panconi, op.cit., p.216. 2. See Panconi, op.cit., p.226. 3. See Jean-Luc Baroni Ltd., Master Drawings and Paintings, 2008, cat.46 and fig.1.